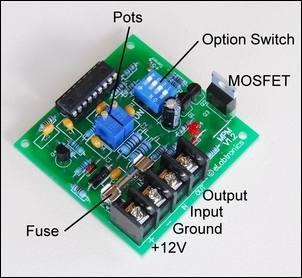 Last week in The eLabtronics Pulser, Part 1 we introduced the eLabtronics Pulser, a cheap and easy to connect pre-built electronic module that allows you to pulse lights, horns, pumps, etc. It’s ideal for alarm applications, flashing high-powered LEDs and a host of applications. Briefly mentioned in that introductory story was that while the Pulser is normally switched on by connecting its Input terminal to power, the Pulser actually turns on when the voltage on the Input rises above about 2.6V. 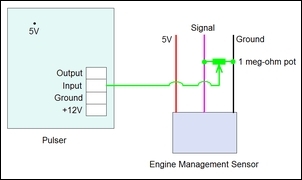 This seemingly minor point is very important, as it allows the Pulser to be automatically triggered by changing light levels, temperature or even the output of an engine management sensor. For example, the Pulser can be configured to automatically start flashing lights when it gets dark, pulse an intercooler water spray (eg for 5 seconds every 15 seconds) when the intercooler gets hot or engine load is high, or even pulse a warning lamp when the outside temp drops to near zero (eg to warn of black ice on the road). It can even be triggered when the difference between two temperatures exceeds a certain amount! Some soldering and component recognition skills are required when configuring the Pulser for automatic switch-on, so the electronic skills needed are a little higher than when wiring-in the Pulser for normal manual use. However, the wiring is still very straightforward. To automatically trigger the Pulser on the basis of temperature or light intensity, use is made of a regulated 5V supply sourced from the module. This is available on the pin shown here. 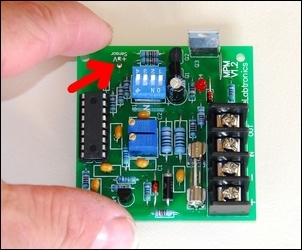 Note that while a regulated 5V is available on this pin, the amount of current that can be drawn is strictly limited. There is sufficient current available to operate the temperature and light sensor circuits described here, but there is not enough current available to run other sensors (eg automotive MAP sensors). In fact, the output current rating of this source is only 2 milliamps. Effectively, the 5V pin supplies a fixed voltage that is them modified by the action of the specific sensor (temp or light) and adjustment pot before being fed to the Input. So how is the Pulser wired for auto operation? Let’s look at temperature first. 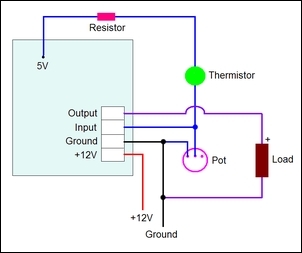 By using one or two low cost temperature sensors (thermistors) and a few other components, the Pulser can be configured to switch itself on the basis of temperature. The switching point is adjustable and a number of different configurations can be used. This is the approach to go for when things need to be pulsed once the temperature rises above a certain point. One example use is to sound an over-temp alarm – eg pulse a buzzer or light. Here is the wiring diagram. Note that for the sake of simplicity, the power and load connections for the Pulser are not shown here (or in most of the wiring diagrams in this story). However, as a special once-off, here is a full working system, complete with ground, +12V and the load connections. The circuit is wired as shown here. Note that the pot is shown from the front view (if you wire the pot in reverse, the adjustment will just work in the opposite direction). You can use any type of 1 meg-ohm pot, including a multi-turn design that will allow finer adjustment of the temperature set-point. The thermistor and resistor have no polarity so they can go into the circuit either way around. 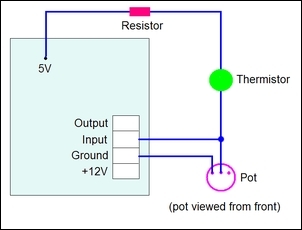 In this circuit, turning the pot clockwise increases the temp at which the Pulser turns on. With the depicted components, the selectable temp range is from about 0 degrees C to about 100 degrees C.
This is the approach to go for when things need to be pulsed once the temperature falls below a certain point. For example, to be warned of the potential presence of black ice on the road, you’d set the system to pulse a dashboard light when the outside temp falls below about 3 degrees C.
Another way of looking at this is to say that the output will be on when it is cold, and off when it is hot. An additional example use is a warning light that stays on when the engine oil temp is still cold. Place the sensor so that it can detect engine oil temp and as soon as the cold car is started, the light will flash. Once the oil temp reaches your pre-set value, the light will stop flashing. The circuit is wired as shown here. Note that the pot is shown from the front view (if you wire the pot in reverse, the adjustment will just work in the opposite direction). As before, you can use any type of 1 meg-ohm pot, including a multi-turn design. The thermistor and resistor have no polarity so they can go into the circuit either way around. 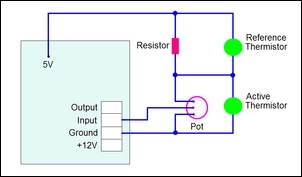 In this circuit, turning the pot anti-clockwise decreases the temp at which the Pulser turns on. With the depicted components, the selectable temp range is from about 0 degrees C to about 100 degrees C.
This is the approach to go for when things need to be pulsed once the temperature difference between two sensors increases above a certain point. The benefit of using two sensors is that it takes into account different ambient temp levels that might exist. An example makes it clearer. Suppose you want to turn on an intercooler water spray when the core temp exceeds 50 degrees C. Trouble is, if the intercooler is under the bonnet, that will happen most times you’re stopped in traffic and the day is hot! The result is an empty water tank. Now change that set-up to using two sensors – one positioned in the general area of the intercooler core and the other actually buried in the fins of the intercooler core. If the spray is set to trip when the intercooler core sensor is (say) 15 degrees C hotter than the other sensor, the spray will come on only when the core is not working sufficiently well – in fact, when it is working as a pre-heater! Tricky, eh? The wiring is carried out as shown here. The ‘reference sensor’ is placed so that it will be the cooler of the two sensors. When the ‘active sensor’ is (say) 15 degrees C higher in temp than the reference, the Pulser will be switched on. This temp difference can be set by the pot. In this circuit, turning the pot clockwise increases the temp difference at which the Pulser turns on. With the depicted components, the selectable temp range is from about 0 degrees C to about 100 degrees C.
Wired in this form, the Pulser switches itself on when it gets dark. 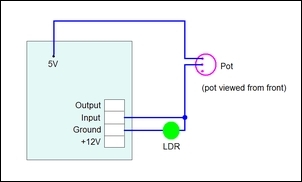 The wiring requires a Light Dependent Resistor (LDR) with a nominal 48 – 140 kilo-ohm response and a 1 meg-ohm pot. Turning the pot clockwise increases the level of darkness needed to trigger the Pulser. Both the thermistors and LDR come as bare electronic components. 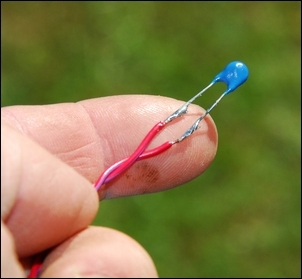 To wire them into place, you’ll need to do two things: solder them to extension wiring and mount them. Shorten the leads and then solder two insulted wires to the leads. 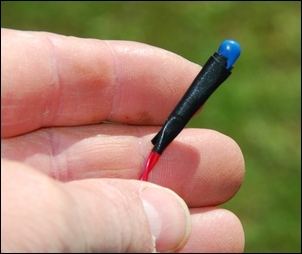 Use insulation tape (when working with relatively low temps) or good quality heatshrink (high temp sensing) to insulate the connections. Insulate them from each other as well as enclosing them. 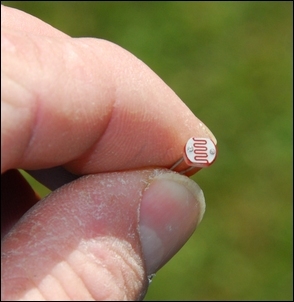 The Light Dependent Resistor (LDR) can be handled in the same way. If the sensor is detecting just ambient conditions (eg in-cabin temperature or light intensity), the sensor can simply be positioned appropriately and held in place with a cable tie. However, if the sensor is working in a much tougher environment, use high-temp epoxy to mount the sensor in a threaded brass fitting so that it can be securely mounted. The Pulser can also be triggered by engine management sensors that output a voltage. That includes most MAP sensors, most airflow meters, and nearly all throttle position sensors. Typically, these sensors output a voltage of about 1-4.5V over their operating range. For example, an airflow meter might have an output of 1.2V at idle, rising to 4.1V at full power. The Pulser turns on when the voltage on its Input exceeds about 2.6V. If in your application, you want the Pulser to turn on at 2.6V, you’re laughing. You just connect the Input of the Pulser to the engine management sensor. But what if you want the Pulser to trip when the airflow meter is at say 2.9V output? It’s easy – and here’s how you do it. 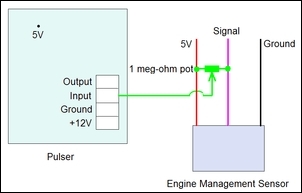 For triggering when the output of the sensor is at more than 2.6V, a 1 meg-ohm pot is wired between the signal and ground of the sensor. The wiper (middle terminal on most pots) is then connected to the input of the Pulser. Adjustment of the pot sets the turn-on point of the Pulser. Simple as that! 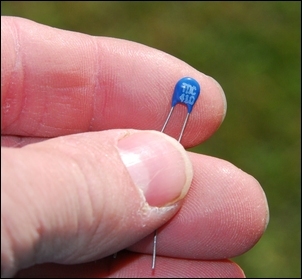 If the voltage at which you want the Pulser to trip is less that 2.6V, wire the 1 meg-ohm pot as shown here. Again, adjustment of the pot sets the turn-on point of the Pulser. The automatic turn-on facility of the Pulser increases its versatility, allowing it to react to changing temperature and light levels, and parameters sensed by the engine management system like load or throttle position. Best of all, the extra components are cheap and the wiring and set-up easy! The Pulser is available fully built and tested from the AutoSpeed Shop - see eLabtronics Pulser Module - Pre Built .